Great for the circulation, this intriguing beauty enhancing medicinal mushroom benefits the skin by increasing the amount of moisture the skin naturally holds and protecting against daily wear and tear from the inside, and to directly smooth skin - no botox required! As well as being a popular culinary mushroom in oriental cuisine, Tremella Fuciformis has a long history of medicinal use and like other jelly fungi, Tremella Fuciformis is rich in bio-active polysaccharides. 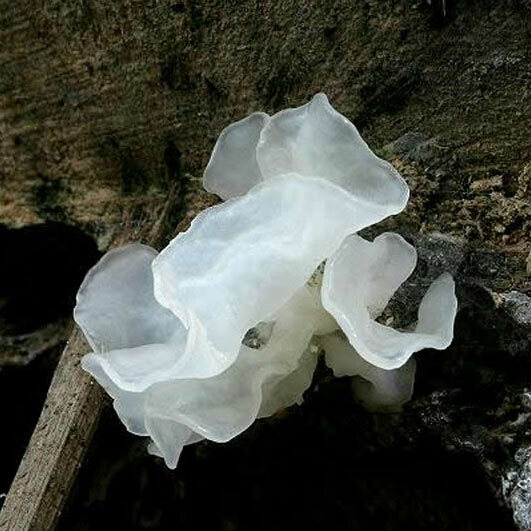 In china, Snow Fungus is a popular an anti-aging supplement with over 40 Chinese patents citing it during the 1990's alone. It's anti-aging effects are due to Snow Fungus allowing the skin to retain more water and helps prevent senile degeneration (the breaking down over time) of micro blood vessels within the skin and keep blood flowing through the skin optimally. Imagine a moisturising lotion, but instead of chemicals being spread on to the skin to hold in moisture, the Snow Fungus helps the skin moisturise and regenerate internally and naturally. Much research in to this medicinal mushroom has focussed on its ability to support the systems of people undergoing chemotherapy. It shows broad immune-stimulating properties and has been shown to reduce the negative effects of radiotherapy and chemotherapy, restoring the blood-producing mechanism of bone marrow. When Cobalt-60 radiation was administered, myeloid granulocytes (an important type of white blood cell which is damaged during chemotherapy) were reduced to 60% among Snow Fungus users, but reduced to 20% for those not using, a significant protective effect. Snow Fungus is also of benefit for those with circulatory disorders and low blood pressure. It's non-cosmetic anti-ageing effects are caused by increasing the superoxide dismutase (SOD) activity of the brain and liver. Snow Fungus is traditionally said to aid memory impairment and benefits learning.